Do you want to measure temperature more conveniently? 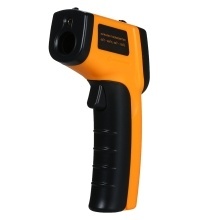 Try this professional digital non-contract infrared thermometer. It provides fast, easy and accurate readings to measure the surface temperature of an object safely and quickly. It&apos;s widely used for food preparation, safety and fire inspectors, plastic molding, diesel and fleet maintenance, etc. Wide measuring range -50～400℃(-58～752℉) for various hot, hazardous or hard-to-reach objects. Temperature test with laser ON/OFF switch & ℃/℉ switch. Digital LCD display with backlight, convenient and easy to read at night. Data hold, low battery indication, laser targeting and automatic power off. Can be widely used in oil and chemical industry, railway, electricity, textile processing, etc. Note: Please do not point laser at eye directly.